Israeli forces continue systematic crimes in the occupied Palestinian territory (oPt) for the week of 06 – 12 July 2017. Israeli forces killed 3 Palestinian civilians, one of whom is a child, in the West Bank. 10 Palestinian civilians were wounded in the West Bank and Gaza Strip, including 2 children and a photojournalist. During the reporting period, Israeli forces killed 3 Palestinian civilians, including a child, north and south of the West Bank. They wounded 10 others, including 2 children and a photojournalist. Six of them, including 2 children, were wounded in the West Bank and the 4 others, including the photojournalist, were wounded in the Gaza Strip. In the West Bank, on 10 July 2017, in excessive use of force, Israeli forces killed Mohammed Ibrahim Jabareen (23), from Taqou’ village, east of Bethlehem. They claimed he attempted to run-over and stab Israeli soldiers on bypass road (60). However, his family denied the claim, explaining it was a car accident. On 12 July 2017, in excessive use of force on 12 July 2017, Israeli forces killed 2 Palestinian civilians, including a child, and wounded a third in Jenin refugee camp, north of the West Bank. On 07 July 2017, 2 Palestinian civilians and an international human rights activist were wounded with metal bullets during their participation in Kufor Qaddoum protest, northeast of Qalqilya. On 09 July 2017, Nour Hamdan (13) sustained a metal bullet wound to the face during an Israeli incursion into al-Eisawiya village, northeast of occupied Jerusalem. On 10 July 2017, Jana al-Rajabi (6) sustained a sound bomb shrapnel wound to the hand during an Israeli incursion into Batn al-Hawa neighbourhood in Silwan village, south of Jerusalem’s Old City. In the Gaza Strip, the border area witnessed peaceful protests against the illegal closure imposed on the Gaza Strip. Israeli forces used force against the protestors, as result, 4 Palestinian civilians were wounded. One of them was hit with a live bullet and the 3 others were hit with tear gas canisters. Among the wounded was journalist Mohammed Baha’ al-Deen Mohammed (30), from Jabalia refugee camp. During the reporting period, Israeli forces conducted at least 43 military incursions into Palestinian communities in the West Bank, and 7 others into Jerusalem and its suburbs. During these incursions, Israeli forces arrested at least 33 Palestinian civilians, including 3 children. Eight of them, including 2 children, were arrested in occupied Jerusalem and its suburbs. Concerning house demolitions, on 11 July 2017, the Israeli municipality demolished a residential building belonging to Hanan Mahmoud in al-Eisawiya village, northeast of East Jerusalem, under the pretext of non-licensing. The 4-storey building is built on area of 800 square meters and comprises of 6 apartments and 2 stores. Mahmoud’s family mentioned that started building it a year ago. On 12 July 2017, the Israeli municipality demolished a house belonging to Mousa Ebaidat in al-Sa’la area in al-Mukaber Mount, southeast of occupied Jerusalem, under the pretext of non-licensing. On the same day, the Israeli municipality demolished a house belonging to Saleh Shwaiki in Beer Ayoub neighbourhood in Silwan village, south of occupied Jerusalem, under the pretext of non-licensing. In the context of settlers’ attacks against Palestinian civilians and their property in the city, on 06 July 2017, a group of settlers and their guards attacked a number of Palestinian youngsters in Batn al-Hawa area in Silwan village, south of Jerusalem’s Old City. They pepper-sprayed and beat them before the Israeli soldiers intervened to disperse the village residents, who gathered to confront the settlers’ attack. On 10 July 2017, the settlers attempted to seize a plot of land belonging to Basbous family in Batn al-Hawa neighbourhood in Silwan village. The settlers claimed the ownership of the plot of land to Jews from Yemen, who used to be the landlords before 1948. Ra’fat Basbous said they were surprised by the settlers’ attacking the land adjacent to their house. However, the residents of the area confronted the settlers. The illegal closure of the Gaza Strip, which has been steadily tightened since June 2007 has had a disastrous impact on the humanitarian and economic situation in the Gaza Strip. The Israeli authorities impose measures to undermine the freedom of trade, including the basic needs for the Gaza Strip population and the agricultural and industrial products to be exported. For 9 consecutive years, Israel has tightened the land and naval closure to isolate the Gaza Strip from the West Bank, including occupied Jerusalem, and other countries around the world. This resulted in grave violations of the economic, social and cultural rights and a deterioration of living conditions for 2 million people. The Israeli authorities have established Karm Abu Salem (Kerem Shaloum) as the sole crossing for imports and exports in order to exercise its control over the Gaza Strip’s economy. They also aim at imposing a complete ban on the Gaza Strip’s exports. The Israeli closure raised the rate of poverty to 65%. Moreover, the rate of unemployment increased up to 47% and youth constitutes 65% of the unemployed persons. Moreover, 80% of the Gaza Strip population depends on international aid to secure their minimum daily needs. These rates indicate the unprecedented economic deterioration in the Gaza Strip. At approximately 13:30 on Friday, 07 July 2017, Palestinian civilians and International activists organized a demonstration in the center of Kufur Qaddoum village, northeast of Qalqiliyah. They made their way towards the eastern entrance to the village in protest against closing that entrance since al-Aqsa Intifada with an iron gate. When the protestors arrived at the abovementioned entrance, the Israeli forces heavily fired metal bullets, sound bombs and tear gas canisters. As a result, A 30-year-old international activist sustained a metal bullet wound to the abdomen, a 42-year-old civilian sustained a metal bullet wound to the ear and a 25-year-old civilian sustained a metal bullet wound to the right shoulder. Following the Friday prayer, dozens of Palestinian civilians and Israeli and international human rights defenders organized a protest in Bil’in and Ni’lin villages, west of Ramallah; al-Nabi Saleh village, northwest of the city, in protest against the annexation wall and settlement activities. Israeli forces forcibly dispersed the protests, firing live and metal bullets, tear gas canisters and sound bombs. They also chased protesters into olive fields and houses. As a result, some of the protesters suffered tear gas inhalation while others sustained bruises as Israeli soldiers beat them up. At approximately 15:30 on Friday, 07 July 2017, dozens of Palestinian young men made their way to the border fence between the Gaza Strip and Israel, east of al-Buraij in the central Gaza Strip, in rejection to the Israeli-imposed closure on Gaza. They gathered near the security fence. They set fire to tires, raised the Palestinian flags and threw stones at the Israeli forces stationed along the abovementioned border fence. The soldiers fired live bullets and tear gas canisters at them. As a result, a Palestinian civilian from al-Buraij refugee camp sustained a live bullet wound to the right leg (PCHR keeps the name of the wounded civilian) while others sustained tear gas inhalation. The wounded civilian was transferred to al-Aqsa hospital in Deir al-Balah and his medical condition was classified as moderate. At approximately 16:30 on the same Friday, dozens of Palestinian civilians gathered few meters away from the border fence between the Gaza Strip and Israel, east of Jabalia in the northern Gaza Strip, in response to calls for protests in the border area against the Israeli-imposed closure on Gaza. A number of the young men set fire to tires and threw stones at the Israeli forces stationed along the abovementioned border fence. The soldiers fired live bullets, tear gas canisters and rubber-coated metal bullets at them. The clashes continued until approximately 19:00 on the same day. As a result, 2 civilians from Jabalia refugee camp were wounded. They were transferred to the Indonesian Hospital in Jabalia. Their wounds were classified as moderate. Around the same time, dozens of Palestinian young men gathered near the border fence between the Gaza Strip and Israel, east of al-Shuja’iya neighborhood, east of Gaza, in response to calls for protests in the border area against the Israeli-imposed closure on Gaza. A number of them set fire to tires and threw stones at the Israeli forces stationed there and in the vicinity of “Nahal Oz” military site. The Israeli soldiers fired live bullets and rubber-coated metal bullets at them. As a result, a number of the civilians sustained tear gas canisters. The clashes continued until approximately 19:00 on the same day. As a result, Mohammed Bahaa’ Eden Mohammed (30), journalist at Shehab News Agency, from Jabalia refugee camp was hit with a tear gas canister to the right hand. He also suffered tear gas inhalation an sustained bruises. At approximately 11:50 on Thursday, Israeli forces established a checkpoint at the entrance to ‘Azoun village, east of Qalqiliyia. They stopped Palestinian vehicles and checked the passengers’ IDs. In the meantime, the Israeli forces arrested Ashraf Ahmed Mahmoud Sukar (30), from ‘Azoun village. It should be noted that Ashraf is an officer at the Palestinian Intelligence Service. At approximately 19:00 on Thursday, Israeli forces established a checkpoint at the eastern entrance to Qalqilyia. They stopped Palestinian vehicles and checked the passengers’ IDs. In the meantime, the Israeli forces arrested Mousa Mahmoud Mousa al-La’ow (30), from Qalqiliyia. At approximately 21:30, on Sunday, 09 July 2017, Israeli forces moved into al-‘Issawiyia village, northeast of occupied Jerusalem. They stationed on the village main street, where they heavily and indiscriminately fired tear gas canisters and rubber-coated metal bullets. As a result, Nour Ayman Hamdan (13) was hit with a rubber-coated metal bullet to the face and was then taken to Hadasah- ‘Ain Karem Hospital in West Jerusalem to receive medical treatment. Nour’s father stated that his son was standing along with his friends on his house balcony on the 3rd floor located on the village main street. In the meantime, the Israeli forces moved into the village and fired tear gas canisters and rubber-coated metal bullets in the area. As a result, a girl was wounded. He added that the initial examinations in the hospital showed that the child’s left eye was directly damaged and she needed a CT scan of the eye. At approximately 05:00 on Tuesday, 11 July 2017, the Israeli Municipality bulldozers demolished a residential building belonging to Hanan Mahmoud in al-‘Issawiyia village, northeast of occupied East Jerusalem, under the pretext of non-licensing. 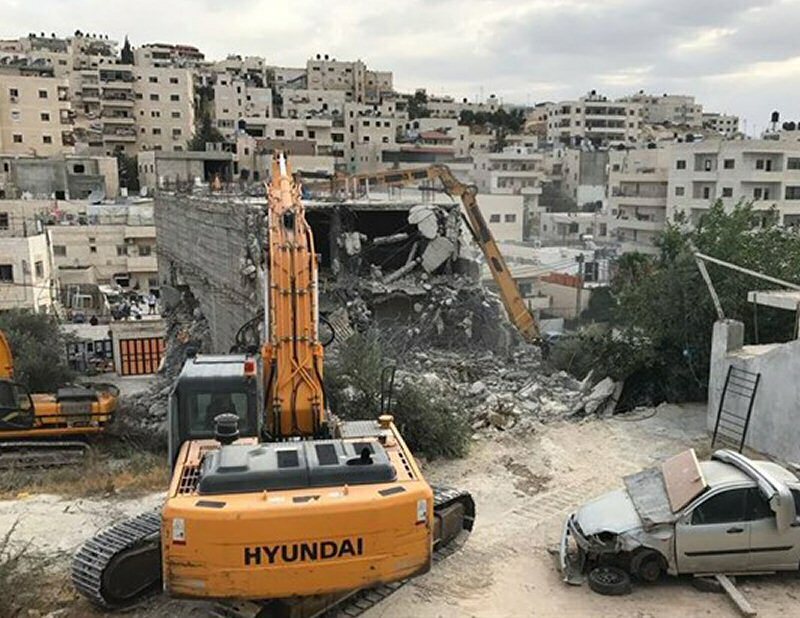 The family stated that Israeli Municipality bulldozers accompanied by the Israeli Municipality crews and Israeli officers surrounded the building in al-‘Issawiyia village and then suddenly demolished it. The family said that the building is comprised of 4 floors consisting of 6 apartments. It was built on an area of 800 square meters a year ago. The family added that the Israeli Municipality took photos of the building and issued an administrative demolition decision under the pretext of non-licensing. It should be noted that the family appointed a lawyer to follow up the case and defer the decision until they get the license. The session was supposed to be held at the Israeli Municipality court. At approximately 07:00 on Wednesday, 12 July 2017, the Israeli Municipality bulldozers demolished a residential building in al-Sal’ah area in al-Mukaber Mount neighborhood, southeast of occupied Jerusalem, under the pretext of non-licensing. The house owner, Mousa ‘Odaidat, said that the Israeli Municipality bulldozers demolished his house without warning the family. It should be noted that the house was built in 2012, and the last year a new building was attached to the same building. Five months ago, the Israeli Municipality issued an administrative demolition decision. Mousa ‘Odaidat added that his nephew, Ahmed’Odaidat, along with his wife and their 3 children, were living in the house. After that, the family was forced to leave the house due to the administrative demolition decision, especially as the Israeli bulldozers suddenly raid the houses and demolish them without warning. Mousa ‘Odaidat stated that the house was built on an area of 200 square meters and comprised of 4 rooms and it facilities. At approximately 09:00 on the same day, the Israeli Municipality bulldozers demolished a house belonging to Saleh Showaiki in Beer ‘Ayoub neighborhood in Silwan village, south of occupied Jerusalem, under the pretext of non-licensing. Al-Showaiki stated that the last year in February, he self-demolished part of his house in implementation of the Israeli Municipality decision. He also said that he had recently made reparations to the house, where his son intended to live there after his marriage scheduled in August. Al-Showaiki added that the house was built on an area of 88 square meters and the Israeli Municipality informed him that his house was demolished because he made reparations to the house. The Israeli Municipality bulldozers demolished a carwash in Beer Ayoub neighborhood, as well as a room used for the carwash, which was built with brick and aluminum on an area of 2.3 meters. At approximately 20:00 on Thursday, 06 July 2017, a number of Israeli settlers and their guards beat up and pepper-sprayed Palestinian youngsters in Batn al-Hawa in Silwan village, south of East Jerusalem’s Old City. The Israeli soldiers then moved into the neighborhood to disperse the families who gathered to rebel the setters’ incursion and attack. The neighborhood residents said that a group of settlers provokingly toured Batn al-Hawa neighborhood. One of the settlers pepper-sprayed Palestinian children and young men who were in the area. Following this, families from the neighborhood gathered and the Israeli soldiers backed by Intelligence officers. Verbal altercations then occurred, and the Israeli forces pepper-sprayed. As a result, a number of civilians suffered gas inhalation and were identified as ‘Oday al-Rajabi, Maher ‘Abdel Wahad Yazan Rajabi and Anas Qara’in. On Monday, 10 July 2017, settlers attempted to seize a plot of land belonging to Basbous family in Batn al-Hawa neighborhood in Silwan village, south of occupied Jerusalem’s Old City, claiming it belongs to 3 Jews from Yemen who used to live on this land before 1948. Ra’fat Basbous said that the family was surprised on the abovementioned morning with settlers’ attacking a land belonging to his family and nearby their house. They accompanied with workers started placing wires to locate the land under the pretext that the Israeli court lately ruled that the land belongs to the settlers but the residents stopped them from doing so. During this, Israeli forces stormed the land and pepper-sprayed the residents. As a result, 6 civilians suffered gas inhalation. Ra’fat Basbous added that the police officer informed the family and the residents of Batn Al-Hawa that they are not allowed to enter or use the land while settlers are allowed to without doing any construction works. It should be mentioned that the land of Basboos family falls within the project of “Ateerat Cohanim” Association to seize 5200 square meters from the Middle Neighborhood in Batn Al-Hawa. ; the projected was revealed by the Association last May. They claim that Jews from Yemen owned the land since 1881, and the land is divided into six pieces identified with numbers: 73, 75, 88, 95, 96 and 97. ‘Ateerat Cohanim claims that the Israeli Supreme Court upheld the settlers’ ownership of the land in Batn Al-Hawa. It should be mentioned that there are 30-35 residential buildings established on the land and sheltering 80 families, who have lived in the neighborhood for dozens of years after they bought the lands and property from the former owners with official papers. Settlers’ attempts to seize lands and buildings in Batn al-Hawa neighborhood have started for 8 years using roundabout ways. Moreover, many families living within the threatened land received evacuation notices, but most of them have so far managed to maintain their property. At approximately 09:00 on Thursday, 06 July 2017, Israeli forces accompanied by military vehicles and a vehicle of the Israeli Civil Administration moved into al-Masafer area, east of Yatta, south of Hebron. The Israeli Civil Administration staff handed the village residents around 22 notices to stop construction works under the pretext that the dwellings and facilities in the area are non-licensed and are located in area (C) according to Also Accord. At approximately 09:00 on Monday, 10 July 2017, Israeli forces accompanied by Israeli military vehicles and a vehicle of the Israeli Civil Administration moved into Qanan al-Nayias area, east of al-Shayyoukh village, north of Hebron. The Israeli Civil Administration staff handed 2 notices to stop the building of 2 under-construction houses that were built on an area of 100 square meters. The abovementioned houses belong to Basheer Idreis Warasnah (50) and Isma’il Ahmed ‘Ayayidah (36). PCHR warns of the escalating settlement construction in the West Bank, the attempts to legitimize settlement outposts established on Palestinian lands in the West Bank and the continued summary executions of Palestinian civilians under the pretext that they pose a security threat to the Israeli forces. PCHR reminds the international community that thousands of Palestinian civilians have been rendered homeless and lived in caravans under tragic circumstances due to the latest Israeli offensive on the Gaza Strip that has been under a tight closure for almost 10 years. PCHR welcomes the UN Security Council’s Resolution No. 2334, which states that settlements are a blatant violation of the Geneva Conventions and calls upon Israel to stop them and not to recognize any demographic change in the oPt since 1967. PCHR hopes this resolution will pave the way for eliminating the settlement crime and bring to justice those responsible for it. PCHR further reiterates that the Gaza Strip and the West Bank, including East Jerusalem, are still under Israeli occupation in spite of Israel’s unilateral disengagement plan of 2005. PCHR emphasizes that there is international recognition of Israel’s obligation to respect international human rights instruments and international humanitarian law. Israel is bound to apply international human rights law and the law of war, sometimes reciprocally and other times in parallel, in a way that achieves the best protection for civilians and remedy for the victims.